Home Bisque Figurines & Other Objects Figurines - Most Popular... Figurine "Party"
Value priced and perfectly sized. 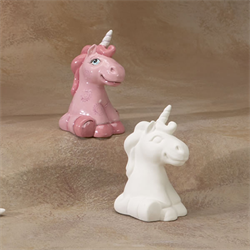 The Party Animals are approximately 4” high, sized between our collectibles and regular figurines, perfect for kid’s studio parties. Kids will love the cute Gare-look of these 15 different designs. Order them all for a complete set.